Corporate marketers and their Advisors, Brokers, and Wealth Managers are facing mounting challenges in attempting to conduct business in their traditional manner. It’s important to understand the underlying issues – from the environment in which financial marketers operate, to new technology that is impacting products, services, to the ways in which Advisors/Wealth Managers communicate with a new breed of customer. These changes in the financial marketplace and new customer expectations have not only had an impact on sales growth and customer retention, but they have also put pressure on the already delicate balancing act that financial brands maintain in supporting their Advisors, Brokers and Wealth Managers. While many business sectors have successfully transitioned to an inbound marketing and marketing automation structure, financial brands and the industry in general, have lagged behind in adopting and demonstrating success with standard approaches to this marketing model. There are a number of reasons for this, but a key driver is the fact that corporate marketing and sales teams at financial companies are not operating under a conventional business model for which most automated marketing strategy and technology were designed. Experts in the field of Marketing Automation and Content Strategy typically promote a simplified inbound marketing cookie-cutter approach to implementing and educating corporate leaders and marketing professionals. However, very few understand the complexities and best methods to demonstrate consistent results in highly regulated, dynamic organizations that support independent and geographically dispersed advisors, broker teams or wealth management professionals – such as financial services. Here is an overview of some of the challenges that we need to understand in order to implement the right strategy, resource support, and technology approach. The financial services marketplace has changed radically due to demographic trends (including aging Baby Boomers and Millennials), new technology (robo and virtual advisors), and an array of new digital communications channels. 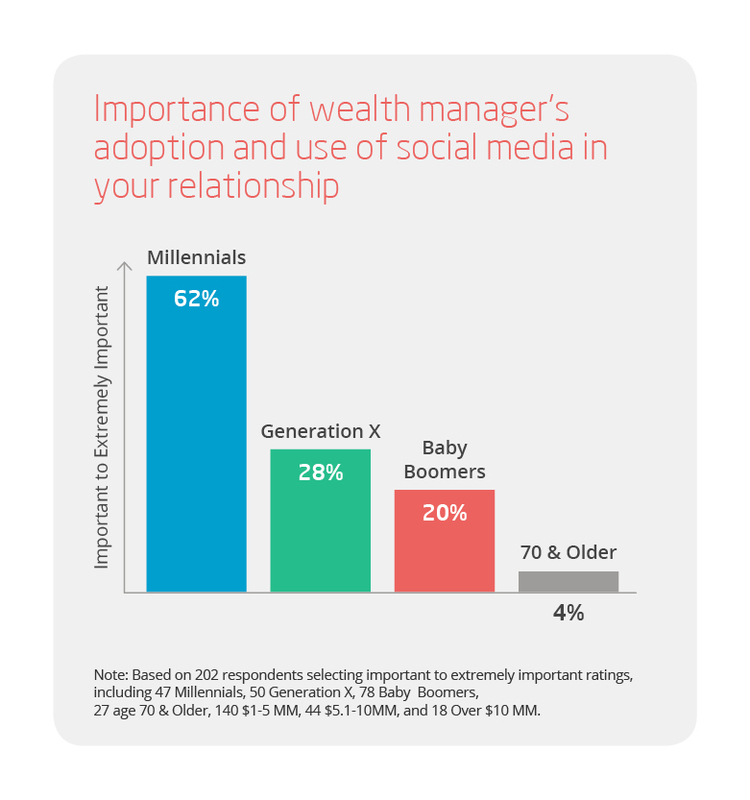 For Advisors, Brokers and Wealth Managers accustomed to marketing to Baby Boomers or Gen X, selling to Millennials requires an entirely new mindset and approach. Identified by the Pew Research Center as individuals “born after 1980 and the first generation to come of age in the new millennium” (1), Millennials have very different expectations on how they want to engage with brands. And they have trust issues. As the first generation raised as “digital natives”, empowered by the vast array of information available on the internet and social media, Millennials have developed a very different definition of an expert. It’s not so much a mistrust of authority, but rather a practice of looking for information online, as well as “social proof” through recommendations of friends. This has major implications for traditional Advisor-client relationships and communications practices. It’s also important to note that Millennials are very communicative, wanting to engage with brands personally and emotionally, but making connections digitally, instead of face-to-face. While marketing research provided by Marketing Sherpa below confirms that Millennials prefer companies to communicate with them via email, they are not likely to be converted via this channel alone. Instead of simply reviewing material sent by their Advisor, the new breed of financial customer is making decisions based on user reviews and peer recommendations shared across social media. These consumers are “crowd sourcing” information from multiple sources, including their peer group and especially non-corporate channels – prior to making purchasing decisions. Financial Advisors and Wealth Managers have always had to master many roles – from educator, to problem-solver, to counsellor and negotiator. In addition, they need to be marketers, excellent time managers, and of course communicators, in order to build their brand, grow their business and meet corporate expectations. But technological advances in products, services and communications channels have increased their challenges in creating, managing and maintaining strong connections with contacts. Furthermore, another factor to keep in mind is the advancing age of many wealth professionals. According to Financial Advisor magazine, the average age of financial advisors in the U.S. is over 50 years and “nearly one-third… fall into the 55 to 64 age range” (8), many of whom are not digitally-savvy. What might be the foundational challenge is the financial industry’s non-traditional business model. Unlike a typical business-to-consumer or business-to-business sales process, in Financial Services, the brand or corporate entity provides trusted and secure products or services which are typically sold through individual experts such as Advisors, Wealth Managers, or Brokers. Each member of this sales force must establish a personal connection and relationship with an individual first before a sale of a product occurs. The Financial Advisor or Wealth Management professional builds and grows their business based upon their personal brand which must convey trust, sound reputation, previous success, and of course, in-depth knowledge of the services they provide. While financial brands and their individual Advisors or Wealth Managers may share many of the same goals and objectives — such as wanting more leads and referrals, increased efficiency / productivity and scalable business — there are some fundamental differences that are crucial in order for each to be successful, as our diagram illustrates below. This very distinct aspect of the financial service model puts much more emphasis on personal connections and trust. Therefore, when applying a digital marketing strategy, the model must consider content marketing, automation and distribution strategies that serve and support the Advisor, Broker or Wealth Management professional directly. This is a nuance and requirement that is typically not properly addressed or even overlooked when financial organizations have implemented a content strategy and marketing automation processes to manage the message distribution and customer engagement. What is the cumulative impact of these changes and challenges? Many corporate or head office marketing and sales administrations are typically providing some impactful resources, useful communications and programs for local Advisors. However, they are not offering the depth and level of support that Advisors, Brokers and Wealth professionals require in order to be successful to grow their personal brands as well as portfolios in this new digital landscape. There is a disconnect between corporate communications and the content necessary to convert potential leads and retain customers. Part of problem is the lack of a comprehensive content strategy that addresses specific needs of consumers. This means putting together a plan to publish and distribute targeted, easy-to-consume, informative content across different channels that target consumers when and where they are likely to consume it. Additionally, most corporate marketing technology in use today, such as email applications, marketing clouds, marketing automation, or social tools, can send out content and execute marketing and sales campaigns. However, very few offer compliance functionality as well as the ability to enable a distributed marketing model on-behalf of Advisors. The compliance piece creates challenges and often barriers to productivity in addition to limiting the progress of organizations advancing their presence across communication channels. How can financial organizations overcome these challenges wealth management digital marketing challenges? With a comprehensive compliance solution in place, distributed marketing functionality could enable greater connections between Advisors, Brokers and potential as well as existing customers. This would entail the ability of a platform or application to create or source content and then distribute that content across different marketing channels either on behalf of individuals and teams, or allowing those individuals and teams to access the content themselves to distribute it to their own personal leads and customers. This change to the source of consumer communications and delivery process would provide Advisors and Wealth Professionals with the ability to grow their personal brand, and as a result see more new connections and business relationships. Some marketing platforms and technology have started to address this concept for specific digital channels such as social media applications or email tools that offer extensive personalization. In fact, the new buzz term “Employee Advocacy” is a popular business trend that social media platforms are promoting heavily to expand the reach of corporate brands and content. However, very few applications or platforms properly address the detailed and complex compliance requirements specific to the financial industry. Furthermore, while employee distribution through social media is a great way to expand the reach of content, it is crucial to enable an integrated multi-channel approach to distributing as well as tracking compliant content by unique contacts. This provides the ability to record and build a profile of individual consumption of content to produce a lead or manage a customer that can be evaluated and prioritized for Advisors to follow up with at the right time. This is a key requirement that cannot be overlooked or understated. It is one thing to be able to deliver compliant content across different channels, but without detailed customer-level behavior tracking, many of the benefits of modern digital marketing cannot be realized. What is missing is the key understanding of how and why an individual behaves and reacting appropriately at the right time through marketing automation and content distribution for increased customer conversion opportunities. Advisors and Brokers that contribute the revenue and holdings to wealth management business are not marketing experts and are often ill-prepared to tackle these challenges. In addition, corporate teams fail to provide some or all of the necessary resources for the critical issues that are the central to their success. That is why financial companies need to take a proactive approach to providing guidance, training and change management practices to educating their teams of wealth management professionals on how to market themselves and how to use content as well as technology to be more productive with engagement of potential and existing customers in a way that builds upon their reputation and trust in the community where they do business. Due to a myriad of challenges and issues the current approach to marketing and sales in wealth management is no longer relevant. Financial companies need to evolve in supporting their Advisors and Brokers on a level that will allow these individuals to build their personal brand. This will, in turn, lead to increased customer relationships as well as higher investment holdings. The marketing and sales process has become more complex and difficult with a new breed of educated digital consumers and proliferation of information available on the internet. To respond, Advisors and Wealth management professionals need great content, technology providing compliance management, and multi-channel distributed marketing, turn-key processes. But Advisors cannot do it alone. Corporate marketing and support teams need to help provide the playbook as well as content, process and technology to provide the foundation for growth. This is where the New Digital Marketing Framework comes into play. Successful adoption of this new model also entails training and support to conduct lead generation, customer management, content distribution and brand growth at the local level. It’s time that corporate marketing, sales and support teams build a strategy playbook and approach that will deliver on these business building requirements so that Advisors can concentrate on their core skills of managing wealth for their customers. This blog post is part of excerpt from our Wealth Management Whitepaper: The New Digital Marketing New Strategic Framework – For financial brands to be successful with activating and building the digital brand of wealth managers as well as advisors. LinkedIn / Greenwich Associates: 2016 Wealth Management Study – Next Generation Customer Journey in Wealth Management, High Tech or High Touch? https://business.linkedin.com/marketing- solutions/blog/marketing-for-financial-services/2016/next-generation-customer-journey-in- wealth-management-high-tech-#! PwC: 2016 Wealth Management Trends.